1985 November, Lions Estate Committee formed. 2005 April, Commence construction of Units 14 and 15 for $120,000. 2009 December, Contribution of $15,000 received from Australian Lions Foundation; construction completed 2010 October. 2016 August - Deb Simpson (CoGB) advised Units President, Lion Frank Dailey that the Tripartite Deed of Agreement had been signed by the CoGB, Wintringham Housing and the Victorian Government's Director of Housing. 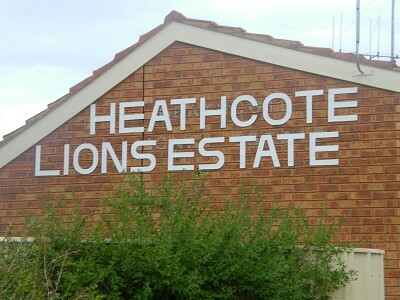 This signing will allow the transfer of ownership of the Lions units to Wintringham Housing. 2016 October (Dinner Meeting) - Vote taken to cancel Lions Estate Incorporation. 2016, October 28 - Official handover to Wintringham Housing took place at the Heathcote Bowling Club. 50 attend, Lions (past & present), CoGB, Wintringham Housing & interested persons.